With the 42nd Super Sentai series almost ready to premiere, the Kaito Sentai Lupinranger VS Keisatsu Sentai Patranger 2nd quarter toy catalog featuring a new ranger and mecha has surfaced thanks to the good folks at Fujiya Hobby. 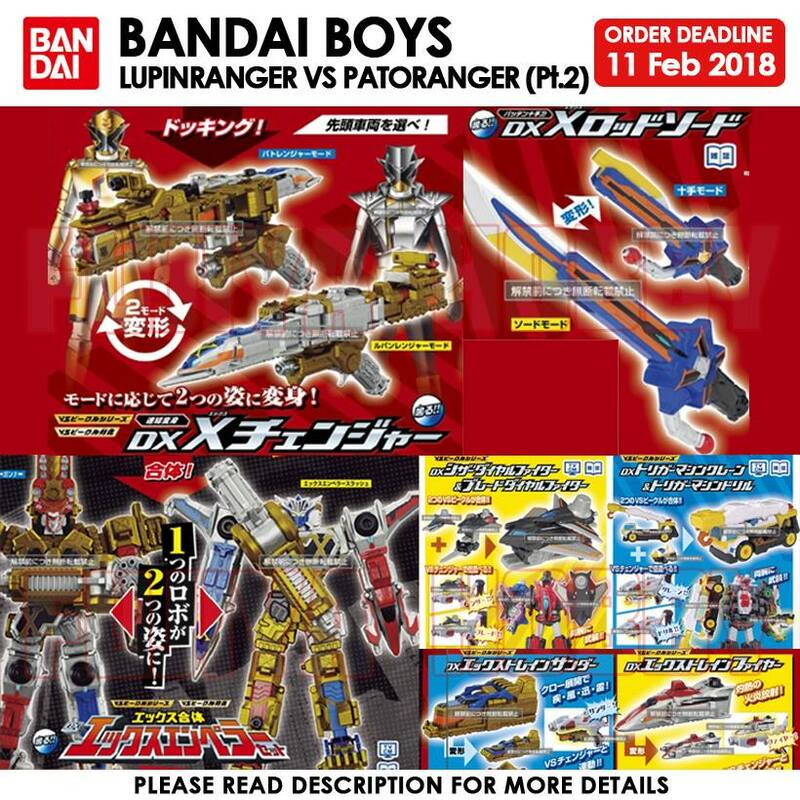 Introducing the newest Ranger on the block who is seemingly a double agent (so that color changing double agent rumor was legit at all) who's called Patran X (gold) and Lupin X. His transformation device is called the X-Changer which has 2 modes: X-Train Fire (Patran X) and X-Train Thunder (Lupin X). On the other hand, both teams will receive a new weapon called the X-Rod Sword. This new ranger will pilot a form changing robot (last time we saw that was in Timeranger) called the X Emperor. Lastly, new auxiliary Dial Fighters (Scissor and Blade) and Trigger Machines (Crane and Drill) will join the action! 2nd quarter catalogue when we haven't even started on the series yet ? That's fast, not complaining cause the new stuff actually looks quite cool . Looks like the X-changer combined with his Trigger Machine and Dial Fighter make X-Emperor. Hrm... interesting gimmick. But sharing so much gear, will this new ranger’s double agent status stay secret for long? His “coat and jacket” suit does give the appearance of a three-part...torso suit? Not sure what to call it... but yeah, that’s probably where those Zyuoh The World vibes are coming from. And are we SURE this isn't TWO rangers using the same device? Interesting idea having the sixth ranger be on both sides but with a different form for each team. I expect he will eventually get a new look combining both of the forms when the two teams eventually team up permanently.